I have spent the past few weeks in my hometown of Melbourne, Australia escaping the bleak English winter. During this time I have been fortunate enough to break up my thesis writing with beach swims and time with family and friends. 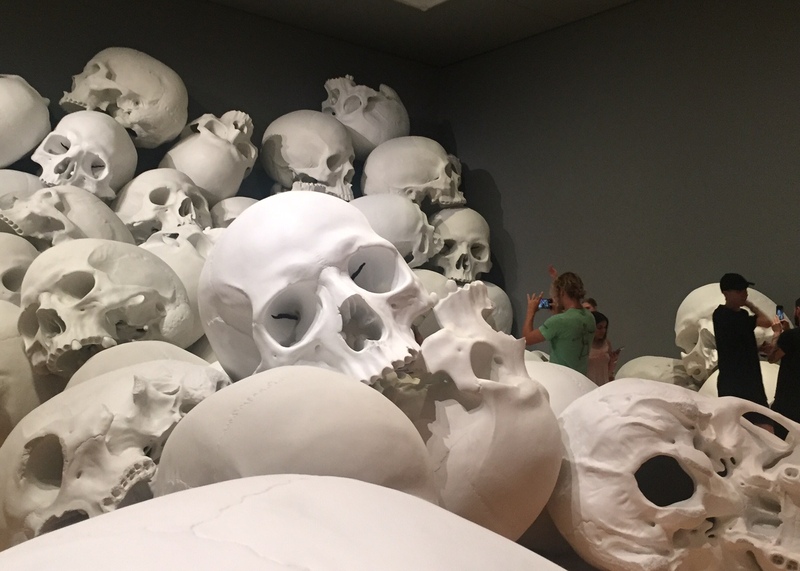 Last week I headed into Southbank to checked out the National Gallery of Victoria’s new contemporary art exhibition, Triennial. The exhibition is the first of what I presume will be a series of exhibitions held every three years that aim to showcase ‘the world of art and design now.’ The day I visited, the gallery was absolutely heaving with visitors young and old. I had actually never seen so many people inside an Australian art museum before. It was great to see the gallery so full of life. 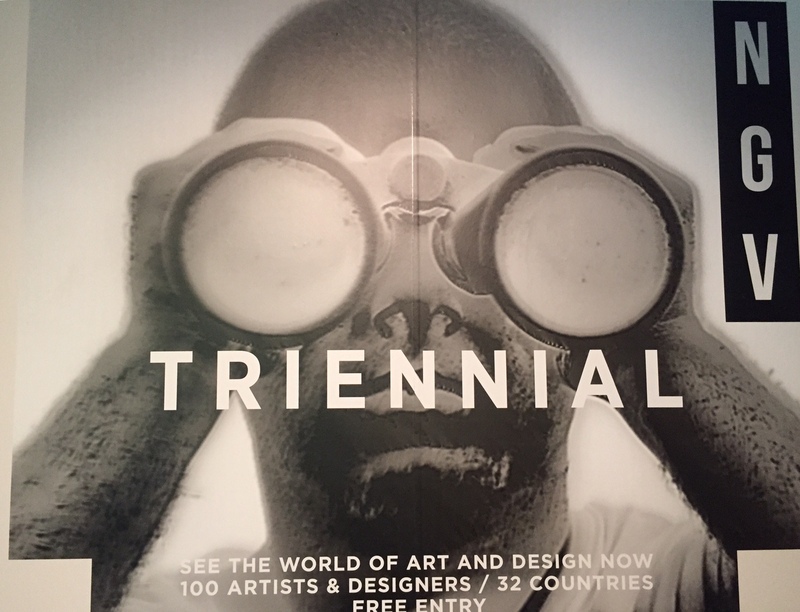 The Triennial features an array of new modern and contemporary artwork from around the globe. 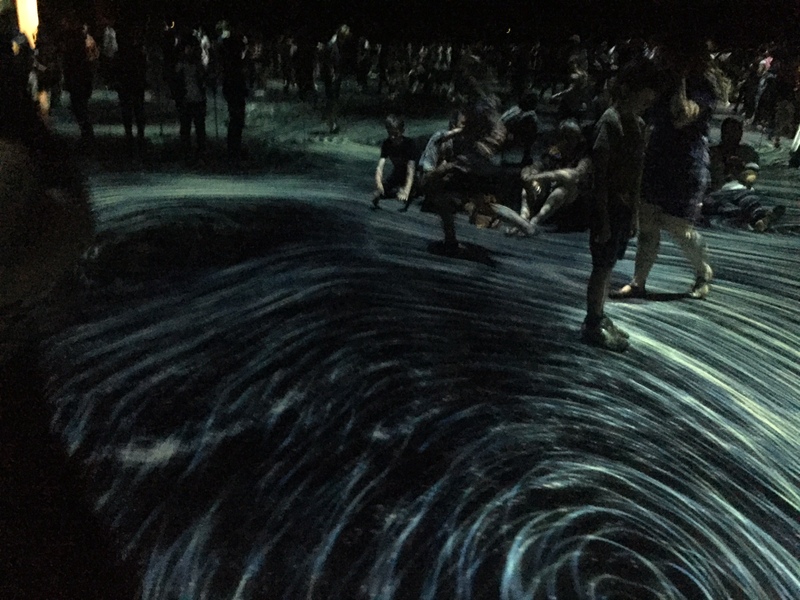 There are also a bunch of newly commissioned, super slick, very Instagram-able installations including Kusama’s ‘Flower obsession,’ Ron Mueck’s ‘Mass,’ teamLab’s “Moving creates vortices and vortices create movement’ and Alexandra Kehayoglou’s beautiful ‘Santa Cruz River.’ The show is ambitious, polished and lively. 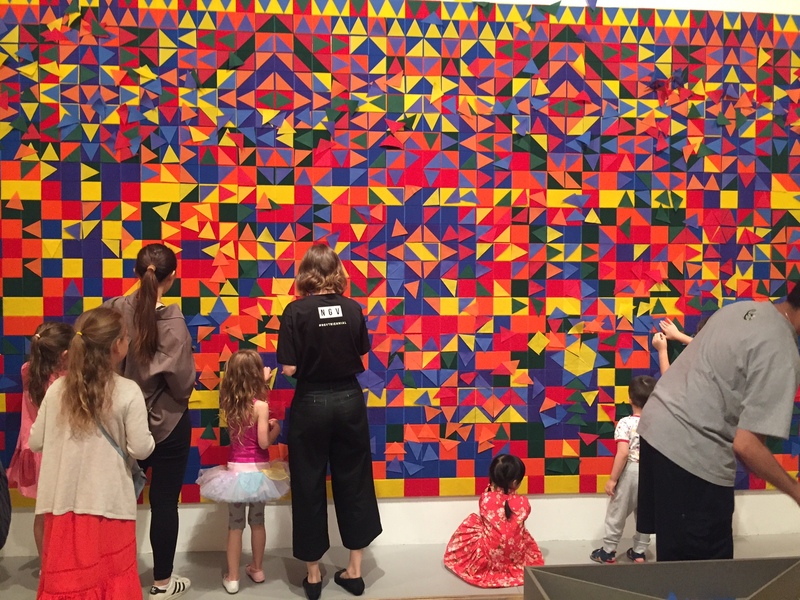 The Triennial’s dedicated children’s space, ‘Hands on: We make carpet for kids’ (2017) was comprised of four parts: a colourful wall where children could stick on triangular velcro pieces, a ‘maze challenge’ where children could poke pieces of rope through a plywood wall, an area where children could stick styrofoam pool noodles onto wooden knobs and a floor activity where children could make patterns using colourful wooden triangles (pics below). At first glance, the space looked immaculate. 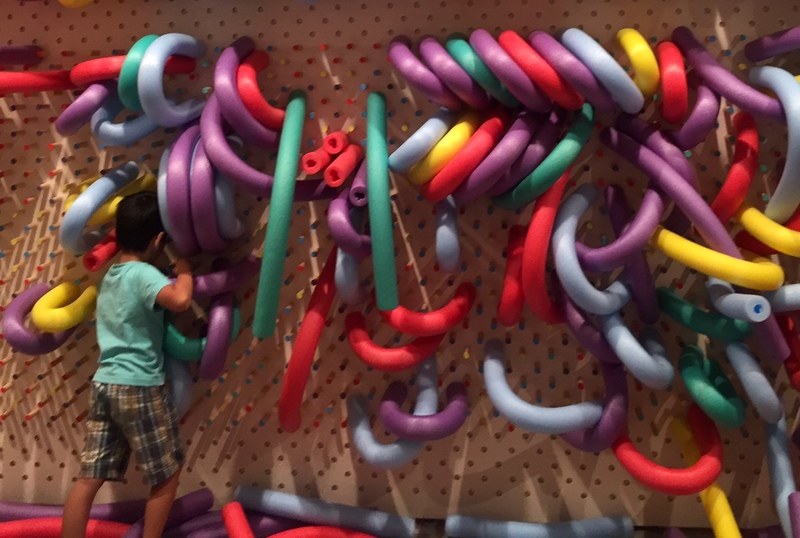 Lots of colours, beautiful wall-mounted installations for children to look at. The space was packed with young families who all seemed to be having lots of fun. It was also really inspiring to see the gallery making such significant financial investments in children’s activities. There appeared to be a gallery staff member stationed at each section greeting people and sorting materials. At the same time I felt like something fundamental was missing from the children’s activities. While in the space I began to consider what exactly it is I love about art and learning. To me, the arts and education have allowed me to continuously think about and connect with the world in new and different ways. Artistic experimentation has allowed me to produce new relationships between myself, other people, ideas and the world around me. 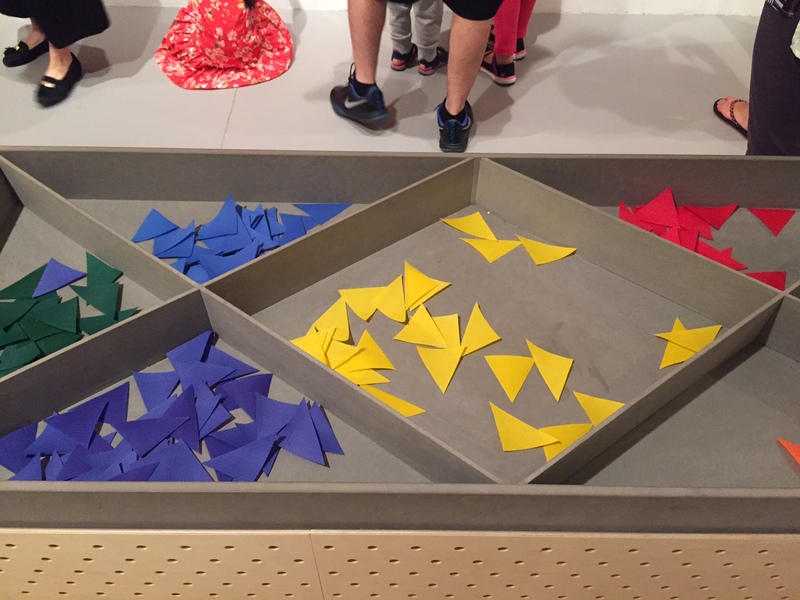 Looking at the children’s activities, I felt like there were limited opportunities for children to engage in deep artistic and creative experimentation. 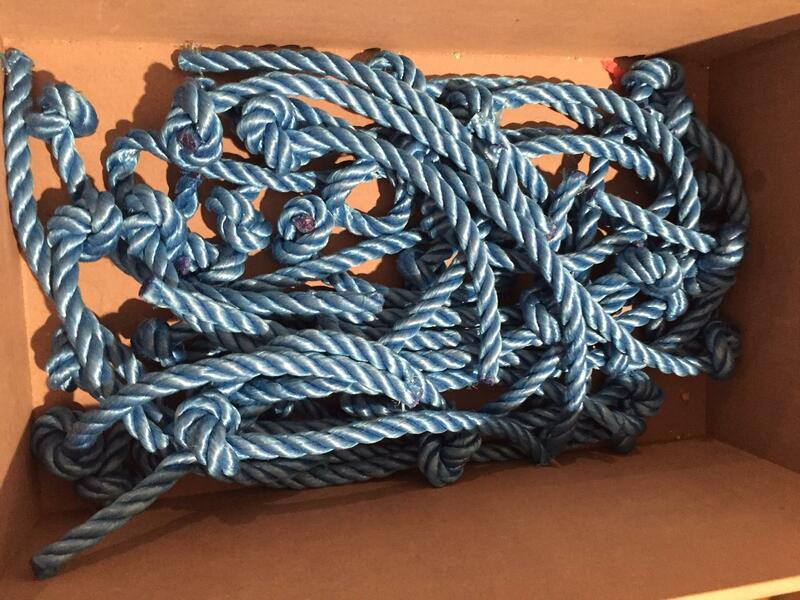 For example, in the rope activity, children were presented with small pieces of the material all cut to the same length. 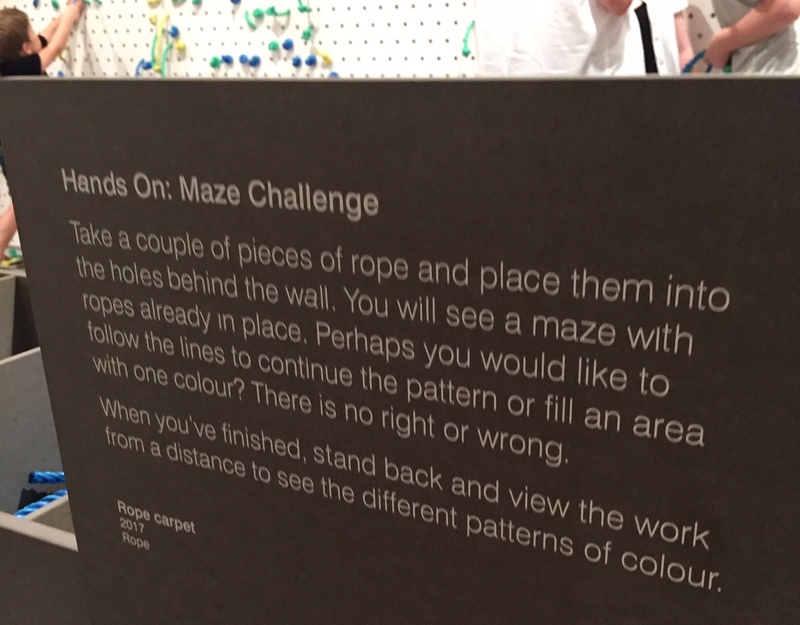 An instruction sign told people to put the rope into the holes. What children can and cannot do is nearly entirely pre-constructed and fixed. 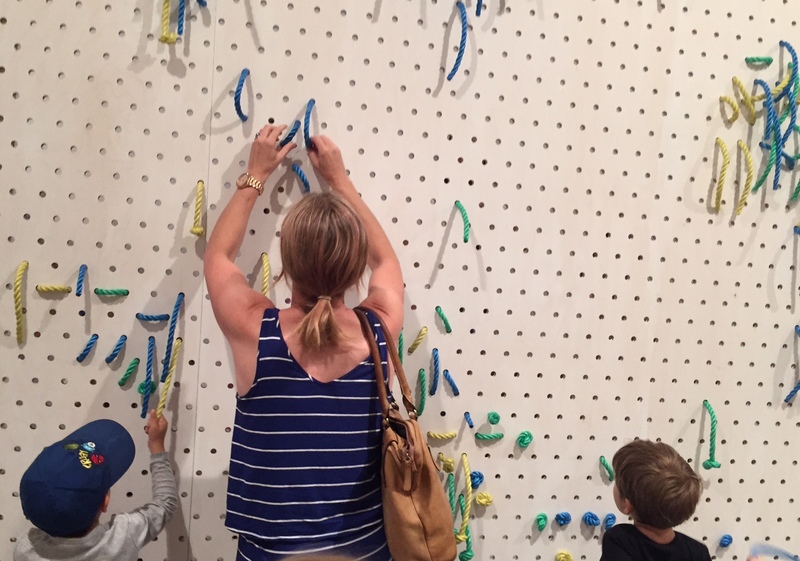 I am really interested in children’s learning environments that are designed to encourage creative experimentation and are responsive to what emerges from this. 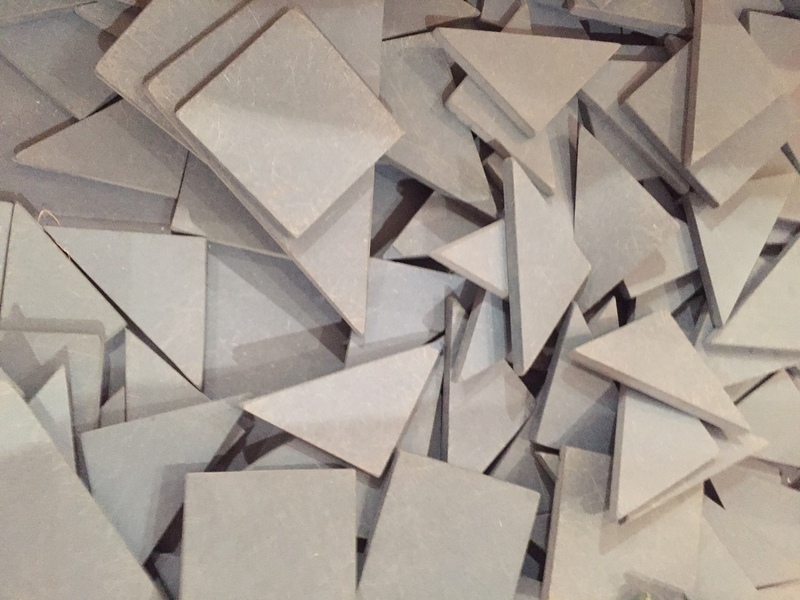 For example, selecting materials based on their ability to transform (for example, clay has the ability to change form through adding or removing water), introducing art tools, equipment, artistic techniques or different conceptual resources that could encourage people to extend, challenge and complexify their thinking through art over time. At the same time, everyone seemed to be having fun and perhaps that is the most important thing. 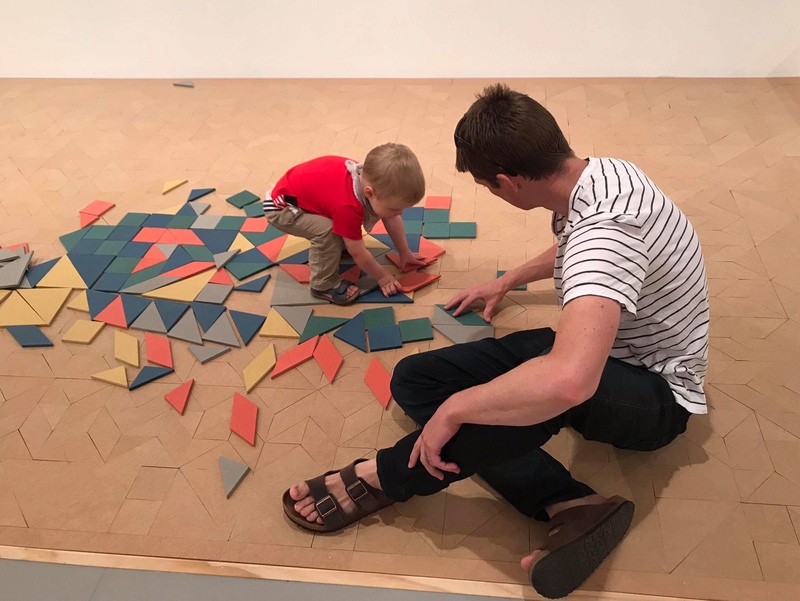 Also, due to the sheer volume of visitors, the gallery may not have been able to cope with children spending more than two minutes on each activity. 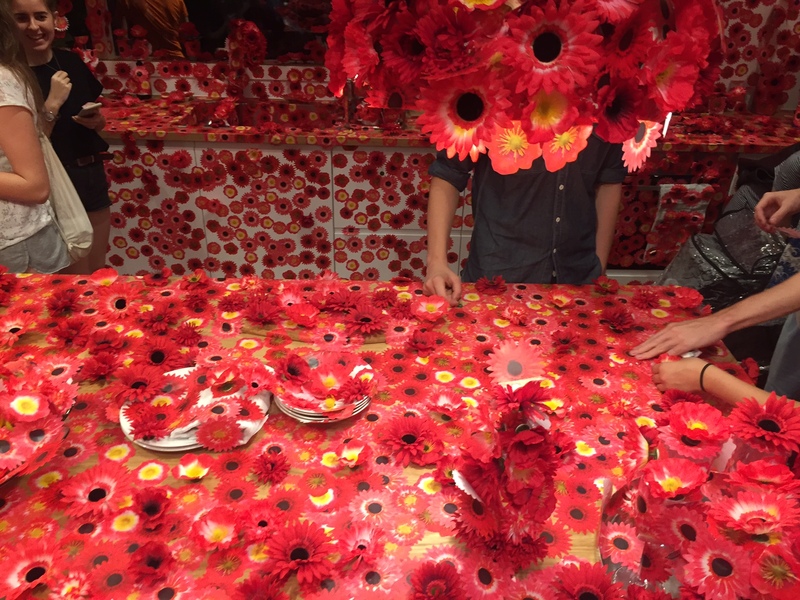 The NGV Triennial is a fun museum experience. There are also some incredible artworks in the exhibition. 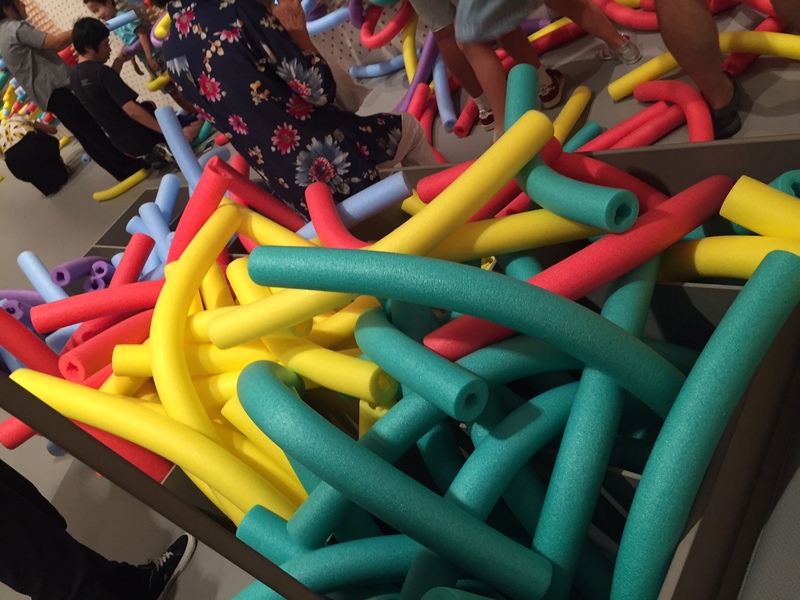 High-brow theme park or contemporary art show – you decide!